Last May, the Interactive Advertising Bureau (IAB) Tech Lab launched ads.txt, which is a text file on publishers’ sites that lists all the vendors that are authorized to sell their inventory. Because domain spoofing and arbitrage have plagued programmatic advertising, ads.txt was created so that ad buyers could have a tool to check whether a vendor’s claim to a piece of inventory was legitimate or not. Adoption of ads.txt was slow at first, but it has really taken off over the past five months. 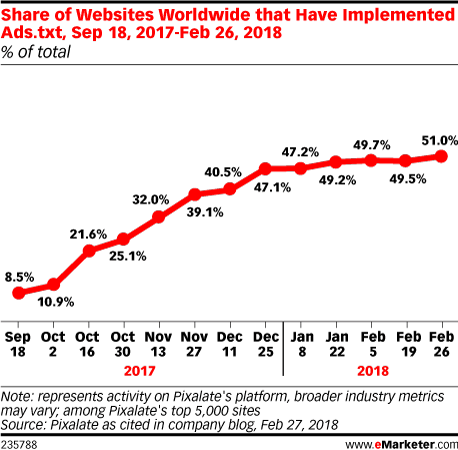 In September 2017, just 8.5% of the top 5,000 websites worldwide selling programmatic ads had adopted ads.txt, according to Pixalate, which used Alexa rankings to score the popularity of websites. But by the end of February 2018, more than half of these sites were using ads.txt. Multiple vendors have conducted their own research around ads.txt, so there are various adoption rates floating around the industry. For instance, MediaRadar found that only 20% of the 3,000 sites in its panel had adopted ads.txt. OpenX found that 54% of the largest 1,000 publishers in terms of comScore Inc. traffic had adopted ads.txt. There are discrepancies across these vendors because they each measured a different sample. When Pixalate analyzed the top 5,000 websites regardless of whether they sold programmatic ads or not, 22.4% of the sites had adopted ads.txt, which is in line with MediaRadar’s findings. The push for ads.txt has advocates across the entire supply chain. Some ad buyers have demanded that publishers adopt ads.txt if they want to be included on campaigns. Several programmatic platforms including Google and The Trade Desk have built filters in their dashboards that allow advertisers to filter inventory by whether or not it is ads.txt verified. Industry groups like Trustworthy Accountability Group (TAG) have also made ads.txt a part of their accreditation process. While ads.txt can help ad buyers avoid unscrupulous sites that pretend to be something they’re not, it isn’t a foolproof way to avoid domain spoofing because publishers misspell and mislabel vendors in their ads.txt files. If ads.txt is to become more effective and easier to navigate, publishers will have to clean up their act since 16% of publishers’ ads.txt files have errors, according to FirstImpression.io.